As I mentioned yesterday, this week marks one year that I've been writing this little ol' blog! 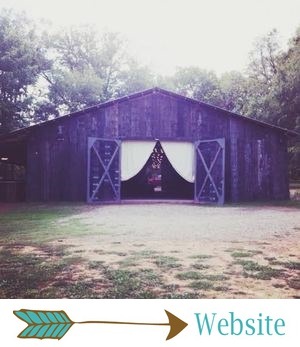 To celebrate, I wanted to share with y'all my favorite Barn Wedding of all... my own! As a former Barn Bride, I can assure you that The Barn and our staff totally live up to the hype. I don't write all these nice things about The Barn because it's my job and I'm expected to... I write them because they're absolutely true! Our photos were taken by Melissa McCrotty Photography, and I'm still convinced she's the most talented photographer Arkansas has ever seen. We're thrilled with our wedding photos, and she was so much fun to work with! Richard and I were married at The Barn at Twin Oaks Ranch on October 12, 2013. We chose blush, gold and cream as our color palette, with plenty of glittery details. We wanted our wedding to have a romantic, whimsical feel, and we wanted it to look relaxed and not too serious. Since I live for a good DIY project, it was very important to me to do many of our wedding details ourselves, even though The Barn Team sure doesn't ask that of their couples! Our invitations were a printable design from Etsy that I had customized to match our colors. I wrote all about that experience here! I found my dress at The White Dress Boutique. It was everything I didn't think I wanted... isn't it funny how that works out? ;) It was only the second dress I tried on, and I was sold. (Looking back, I wish I would have tried on more, because trying on wedding dresses is perhaps the most fun thing in the world for a wedding-obsessed lady like me.) It was poofy in all the right places, had little lace details all over the tulle, and I'm still obsessed with that train! Our bridesmaids' dresses came from a website that I'm not even going to link to, because honestly, buying your bridesmaids' dresses online isn't the best idea. My girls' dresses all turned out great, but that isn't always the case when ordering online! I loved their dresses so much, but I'll admit that it was a little bit risky, because the company we ordered from doesn't have the best reviews. I chose a simple, elegant color that I thought would look good on everyone, and then I told them to choose any style, as long as it was floor-length and chiffon. They looked so beautiful, and I loved how all the dresses looked together! Richard and his groomsmen wore gray suits and blush ties from Formal Affairs. They looked fantastic! Totally swooning over my groom. ;) I loved how the bridesmaids' champagne dresses looked with the groomsmen's gray suits. Classic, elegant, and so. darn. pretty! I made the flower girls' pink tutus, and it was such a fun, easy project. They also wore gold glittery ribbon belts and the prettiest astilbe flower crowns! Our flowers were unreal. Barn flowers are the best flowers! People still talk about our wedding flowers, and I still find myself obsessing over them, too. They were probably my favorite detail from our wedding! I chose garden roses in shades of pink, ranunculus, dahliahs (they were AMAZING), spray roses, pink and white hydrangeas, astilbe and dusty miller for the bouquets and floral arrangements. The bouquets were wrapped with sequined gold ribbon! Richard wore a pink ranunculus boutonniere, and the groomsmen wore white ones. The mothers' and grandmothers' corsages consisted of pink spray roses, astilbe and dusty miller. Our first first look took place on top of Mount Nebo, in the spot where we got engaged, a few weeks before our wedding. We decided to have bridal photos taken together prior to our wedding day so we could have plenty of photos in our wedding attire in different locations. It was also a good way to get our nerves out! So our "first" look at The Barn was actually our second look. When we finally saw each other, we talked about... the weather. We've been an old married couple since day one! We also got a bunch of gorgeous, romantic photos together that we'll treasure forever! Our ceremony decor was so perfect! Our aisle was lined with logs and tons of floral arrangements that matched our bouquet, as well as pink flower petals. Our lace altar was so dreamy! The chandelier was the perfect detail. Our guestbook table was filled with pink and gold pretties. The guestbook itself was a book that I made of our engagement photos. We also had our guests write a wish or word of advice for us on a tag and hang it on a tree, which we watered during our ceremony. I made a couple of chalkboard signs for the ceremony, and Richard painted my bike pink and gold! We put a basket on it, filled it with flowers, and it was my favorite ceremony detail. Our ceremony was very simple and full of love. I thought I'd be super nervous/sick when I walked down the aisle, but I was surprisingly 100% calm. It was the most amazing feeling to see the faces of our closest friends and family as I walked down the aisle toward my love. We said nontraditional vows, and we didn't cry! Our officiant, Richard's uncle, read a few readings that were special to us, and then we watered our unity tree together. And then it was official... we were husband and wife! By the way, my husband hand-lettered these beautiful signs! Another DIY detail that I loved. After we were pronounced husband and wife, we enjoyed a few private moments together and then went off to hug our families, take a bunch of photos and head to The Barn for the end of our cocktail hour. These tassels hanging over the lawn are another detail I'm still crazy about! For our favors, we asked our families to bake lots and lots of delicious pie. We printed out a pie box template, made a whole bunch of them, and packaged individual pie slices. We also bought some wooden forks on Etsy, glittered the handles, and tied them to the boxes with twine and a little tag that told each flavor. In my opinion, it was kind of the best favor ever. Who doesn't love pie?! We spent the rest of our reception doing all the wedding things, like cutting our cake, a bouquet and garter toss, playing lawn games, riding the pink and gold bike (best wedding entertainment ever) and watching our loved ones tear up the dance floor. After our sparkler exit, we ended up hanging out for a while longer, sitting outside underneath the stars with our closest friends and family. Then we went home, slept it off, ate cake for breakfast, and left for our honeymoon! We road tripped to Colorado, one of our favorite places to visit together. We didn’t make any plans or book any hotels; we just spontaneously road tripped all over the mountains, staying in a different town every night . We got snowed in once, ate so much great food, and spent a few days nerding out over all our favorite mountain views! It was romantic, frigid cold and the perfect way to begin our lives together as husband and wife!